WIMBLEDON – Somewhere close to noon on Wednesday, one of the my housemates, Tennis.com’s Steve Tignor, told me that John Isner had suffered a knee injury in the first set of his match against Adrian Mannarino. I immediately thought back to Sydney, when big John came into the pressroom after his loss to Ryan Harrison and essentially said his knee was wrecked and that he had little chance of playing the Aussie Open. A couple of days later, he pulled out. A few minutes later in London, Tignor told me that Isner had actually retired and thus began the craziest day I have ever covered at a major since I began reporting on the sport back in 1992. A little over an hour after Stepanek’s pullout, Caroline Wozniacki slipped and badly twisted her ankle in the fourth game of her match against Petra Cetkovska. She couldn’t run after that and was plastered 6-2, 6-2. Sometime later, No. 10 Marin Cilic pulled out with a knee injury too. Bernard Tomic, who is still in the singles draw, retired in doubles with a hamstring problem. The Yaroslava Shvedova pulled out against Petra Kvitova. Wimbledon had set an Open Era record with retirements/walkovers with seven, and all the talk was about whether the slippery courts were to blame. But there was something in the air that wasn’t related to seed germination. Perhaps someone has opened up a catacomb at the London Dungeon and unleashed some foul magic, which is why Cilic later called it a “very black day.” Whacked Wednesday at Wimbledon was on, and it wouldn’t stop there. Azarenka is suffering from a bone bruise and was very upset that her chance of winning her first Wimbledon title had gone away before she could dig herself into the tournament. Maria Sharapova, who has been so very consistent at the major over the past two years, went out onto the Graveyard Court 2 against former phenom Michelle Larcher De Brito and fell down a remarkable down three times. She eventually received a medical timeout for what appears to be minor hip injury, and although she tried to fight, she seemed distracted, was way off her game on the big points, and landed with thud in in her 6-3 6-4 loss. She gave her foe credit for the win, but at one point in the second set she called the conditions dangerous. Wozniacki looked like she cried a great deal after her defeat. After all, she needed a redemptive Slam and didn’t come close to having one. It’s one thing to take another harrowing loss, but with no chance to move quickly and try and impose her game. Cetkovska drop shotted the speedster to death. Other seeds fell too before the catastrophe for Roger Federer and his fan base really set in. Canadian teen Eugenie Bouchard played brilliantly in upending No 12 Ana Ivanovic 6-3 6-3; Karin Knapp upset No. 27Lucie Safarova 4-6 6-4 6-4; young Serbian Vesna Dolonc beat older Serb and No. 16 Jelena Jankovic 7-5 6-2; and Camila Giorgi of Italy took down No. 22 Sorana Cirstea 7-6(7) 7-6(6). On the men’s side, Dustin Brown overran former champ Lleyton Hewitt in four sets. 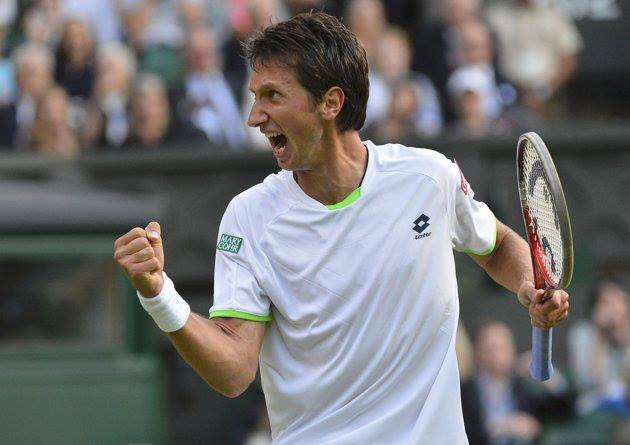 But nothing else on court compared to Sergiy Stakhovsky shocking defending champion Federer 6-7(5) 7-6(5) 7-5 7-6(5), which was the Swiss’ earliest defeat at Wimbledon since losing in the first round in 2003. The Ukrainian put together a brilliant, old school serve-and-volley attack, never allowing the Federer to get his rhythm and suffocating him at the net. The Eastern European journeyman matched Western European journeyman Darcis’ level on court in the Belgian’s stunner over Nadal, and perhaps even more so: the result ended Federer’s run of 36 consecutive Grand Slam quarterfinal appearances dating back to 2004 Wimbledon. It wasn’t just luck, he can up huge on the big points while Federer faltered. The Swiss said later on that he thinks there have been periods where he’s been playing great at the majors, but the 31-year-old is certainly not playing as well as he did in his heyday, which is why he now has gone a year without reaching a Slam final and has only won two tournaments during that stretch. He then chided the press for saying that he and Nadal would automatically meet in the quarterfinals. Perhaps there is lesson learned in there, but given that the “Big 4” has combined to win 36 of the last 39 Slams and that Federer and Nadal rarely lose early, especially at the same tournament, it was only logical to think that they would meet again. Even if they were not going to win Wimbledon, no one would have picked two veteran guys like Darcis and Stakhovsky, who haven’t never been relevant in the majors, to pull off stunners such as those. But then again, would anyone have put money down on trifecta picks of Larcher De Brito, Bouchard and Dolonc over three former No.1’s, or seven retirements/pullouts in one day, or the fact that in both bottom halves of the draw there are only 15 combined seeds out of 32 headed into the third round. Not by any stretch of the imagination. So when the dust settled after a very exciting and hard to gage day here is what then tournament has on the bottom halves: on the women’s side there certainly is an attractive group of young women left lead by Sloane Stephens, Bouchard and Monica Puig (read here) with former finalist Marion Bartoli and 2011 titlist Kvitova kicking around, but given that none of them have been playing consistent standout ball, chaos could still reign there. On the men’s side, Andy Murray still stands and is a substantial favorite to reach the final again, but there are only three “younger” men with character and game left in Gulbis, Jerzy Janowicz and Benoit Paire. Nicolas Almagro, who has never been a fan of grass, is also in the mix. Imagine if he reached the semis out of Federer and Nadal’s half. That would be as whacked as what occurred on Wednesday at Wimbledon, but after such a bizarre day, anything goes for the rest of the fortnight.